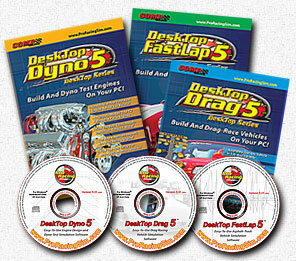 Product Summary: All three levels of ProRacing Sim simulation software (Dynomation-5 professional, DynoSim5 Advanced, and DeskTop5 Low Cost) are now available in Bundle Packages. Enthusiasts can purchase both Engine and Vehicle simulations in coordinated packages, guaranteed to work together, at discounts of up to 50%! All ProRacing Sim software is compatible with WindowsXP/Vista/Win7 & 8. Send questions or comments about this web site to latherton@proracingsim.com. Copyright (c) 2003 ProRacingSim, LLC. All Rights Reserved. No part of this document may be reproduced without the explicit written permission of ProRacingSim Software.